Vascular disease can strike anyone, at any age, at any time. And it often strikes without warning... symptoms may not appear until it is life threatening. Important: If an emergency arises, get medical treatment immediately — Dial 911 — especially if you experience loss of vision, slurred speech, extreme dizziness or confusion, weakness in a limb, or severe chest or abdominal pain. Quick action can save your life. Keep your cholesterol levels under control. Communicate your family health history to your doctor, particularly if a blood relative had poor circulation, high blood pressure, high cholesterol or cardiovascular disease. 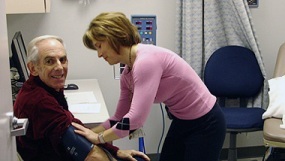 Get regular physical examinations from your doctor.